Application solutions for consistently better immunohistochemical analysis. These products are the same reagents used by our scientists when validating our primary antibodies, so we have the experience to support every step of your immunohistochemistry (IHC) experiment. 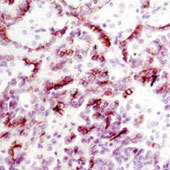 Featured Image: SignalStain® Boost IHC Detection Reagent (HRP, Rabbit) #8114.